To see El Torcal we stayed in a Parador: the Parador de Antequera, which was really nice. Not quite as spectacular as the Parador inside the Alhambra, but not as hard to book and expensive either. I can see why they have special promotions for 18s-35s in the Paradores - Em and I were 20 years younger than anyone else staying there. El Torcal was an interesting place. We hiked out amongst the limestone karsts for a couple of hours (there are only two trails and we did the longest one) and got great views over Antequera. We spent some time walking through Antequera, and despite the heat, hiked up to the Alcazaba for some great views. 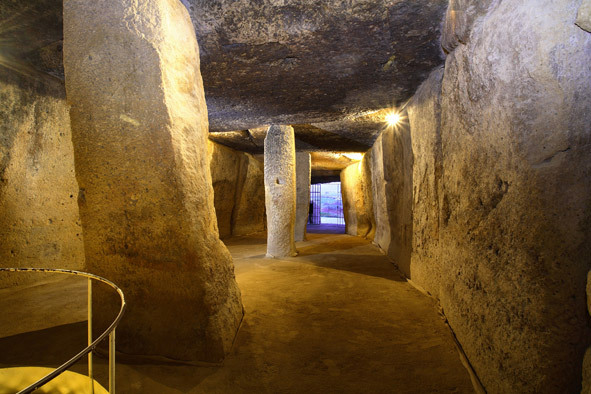 On our way out of town we saw the Dolmen de Menga and Dolmen de Viera: two tombs built over 4000 years ago out of giant stone slabs, kind of Spain's answer to Stonehenge.